Did you know the library provides services to schoolchildren even if their families are not able to regularly visit the library? That’s thanks to our Bookmobile. Our Bookmobile team members are the library’s ambassadors to children across Greene County. 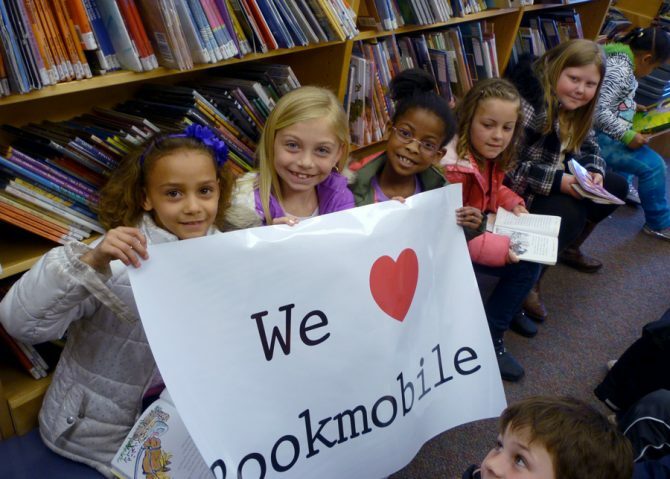 Throughout the year the Bookmobile visits schools, preschools, and daycare centers around the county, giving many children their first public library experiences. Students can check out two books from the Bookmobile at a time, giving many of the youngsters an early lesson in responsibility. Students don’t need to carry library cards. The Bookmobile keeps a binder with a barcode for each student, making checkout easy peasy. While visiting the Bookmobile children see first-hand some of the ways librarians can help them. It could be as simple as expert assistance to help them find a book or recommending a new favorite author. And those books students use for reports in their classes? A good portion of those also come from the Bookmobile. So next time you’re out driving the roads of Greene County and see the Bookmobile, give them a friendly wave to cheer them on their way to helping our children discover, learn, and grow.